Mi Reloj Es Azul: 71st Golden Globes, bring it on! 71st Golden Globes, bring it on! Soooooooo, welcome everyone onboard! Mi Reloj es Azul is intended to be a place for everybody. I will be posting all sorts of things and hope that you enjoy the adventure that begins today. Honestly, I've been working on this for quite a long time and can't wait to start writing! First of all, let me introduce myself. My name's Pepe and I live in Madrid. I'm 15 and am keen on almost everything. And I say almost because there's something that I cannot stand: math. So, for those of you interested in math..., I'm very sorry to say that this isn't the best place for you guys. But let's begin. The big night's here! After weeks of predicting and making bets, the list of the actual winners of this year's Golden Globes will be released tonight. I've been investigating a lot and have watched some of this year's blockbusters. Here are my predictions on the main categories! 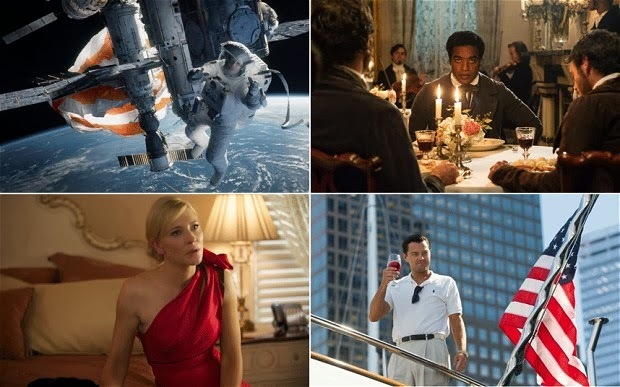 There are two films that stand out among the five nominees: 12 years a slave and Gravity. Everyone agrees that it'll be down to these two. But I'll go for Gravity, which seems to be the leading horse after the critic's positive veredict and the fact that Sandra Bullock is simply speechless. It's all about Cate Blanchett. Bullock's portrayal of a woman lost in space won't be enough to beat the driven crazy Jasmine. Blanchett's leading role in Woody Allen's latest film reaches perfection. Cate has this one in the pocket, without a doubt. My bet is Robert Redford, although Chiwetel Ejiofor's role in 12 years a slave is a masterpiece, the HFPA might just go for Redford due to the fact that he hasn't won anything in years and his role is just as good as Ejiofor's. American Hustle might have this one in the bag. A great story and an outstading cast might be the perfect combination for taking American Hustle to the podium. Those who know me well know I have a real devotion for Meryl Streep. Plus, many believe Meryl's role as Violet Weston in August: Osage County may cost Blanchett this year's Oscar in the leading role category. Amy Adams is a very strong contender too so don't take things for granted!! But yes, my pick is Meryl. DiCaprio's leading role in The Wolf of Wall Street will win this. At least that's my opinion, based on the fact that none of the rest contenders are among the odd's favourites. And that's all folks! To wrap up, Gravity will be tonight's protagonist as well as his director, Cuarón, who will take home the award for best direction. Julia Roberts will win the Supporting Actress category for her outstanding work as Meryl Streep's daughter in August: Osage County and Bradley Cooper will do the same in the Supporting Actor category for his role in American Hustle. Feel free to make your choices and... enjoy the night! !